2. Interested in working on a cruise ship? Resumes sent to us by YOUTH! 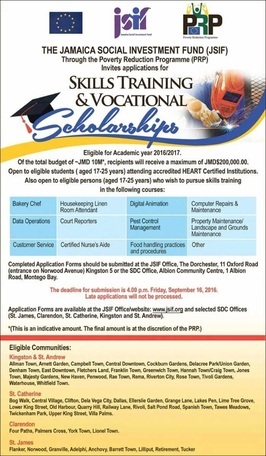 There are several scholarships offered by the Government of Jamaica as well as private sector organizations both locally and internationally. Below is a listing of available scholarships and links to the different sites to download information. Ministry of Education Tertiary Scholarships: These are Scholarships/Awards that will be administered by the Tertiary Unit of the Ministry of Education for the 2010/11 academic year. The Awards are offered to Teachers/Students desirous of pursuing higher education. 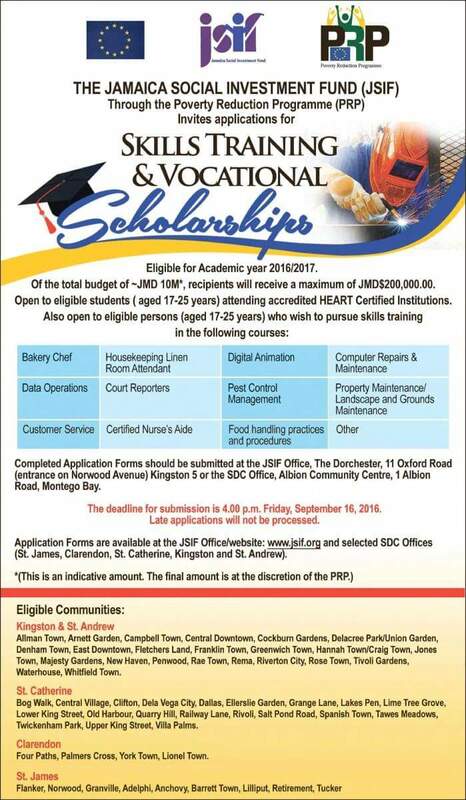 Scotia Jamaica Foundation Scholarships: Each year the Foundation contributes millions of dollars in scholarships and bursaries to individuals who need financial assistance or who excel in academic performance. The Ms. Esmie L. Walters Scholarship: In honor of Ms. Esmie L. Walters, an essay competition has been established, in her name, as a way of recognizing her commitment to education. This scholarship is valued at $ 25,000 JMD and will be awarded to a high school student with the best essay! The deadline for applications for study has passed. Continue to check this website for information on the 2014 round of scholarships. Applications are usually in July. The Horace A. Daley and Leopold E. Gordon Scholarship: Professional Jamaicans for Jamaica, Inc. (PJFJ) recognizes that many Jamaican students from poor communities struggle every year to secure the necessary finances, in order to obtain a Bachelor’s degree at one of our universities. This scholarship is valued up to $300,000 JMD and will be awarded to a first-year university student with the best essay and who demonstrates financial need. Continue to check this website for information on the 2014 round of scholarships. Applications are usually in June. NCB Foundation Scholarships: The NCB Foundation Scholarship Programme is officially open to students islandwide seeking to fulfill their academic dreams. Financial assistance is provided to cover tuition fees, school books, uniforms, accommodations and other school related expenses.. Continue to check this website for information on the 2014 round of scholarships. Applications are usually in July. Pocket Rocket Foundation Scholarships: The Scholarship will be open to all high school students from 2nd form (Grade 8) to 6th form (Lower and upper/ Grade 12 & 13) who participate in sports and express the need for financial assistance. Applications are now being accepted. Application form here. Continue to check this website for information on the 2014 round of scholarships. Applications are usually in March. Jamaica Energy Partners Scholarships: Jamaica Energy Partners (JEP) recognizes the need for academic advancement in order to foster economic development in Jamaica. The Company remains committed to assist in laying the building blocks for academic success in the parish of St. Catherine, in which it operates. Continue to check this website for information on the 2014 round of scholarships. Applications are usually in June. Chevening Scholarship: Chevening Scholarships are the UK government’s global scholarship programme, funded by the Foreign and Commonwealth Office (FCO) and partner organisations. The programme makes awards to outstanding scholars with leadership potential from around the world to study postgraduate courses at universities in the UK. The Deadline for applications is November 8, 2013. AAUW International Scholarships: The program provides support for one year of graduate or postgraduate study in the United States to women who are not U.S. citizens or permanent residents. Preference is given to women who show prior commitment to the advancement of women and girls through civic, community, or professional work. Fellowships are available for study in the U.S.A. The deadline for applications is December 1, 2013. Government of Mexico Scholarships: Under the framework of the bilateral cooperation programme between Mexico and Jamaica, and the initiatives of Cooperation offered by Mexico to the Caribbean Community (CARICOM), and the Association of Caribbean States (ACS), the Government of Mexico annually offers a comprehensive programme of scholarships to Jamaican nationals to undertake complete programmes of Specialization, master's or PhD degrees, and Postgraduate researches. Continue to check this website for information on the 2014 round of scholarships. Applications are usually in August. Australia Awards: Australia’s international development assistance in the Caribbean aims to assist in building Caribbean countries’ own capacity to progress towards the Millennium Development Goals (MDGs) by reducing their vulnerability to the impacts of climate change, natural disasters and economic challenges. Australia Awards are aligned with Australia’s development assistance in the Caribbean, targeting human resource gaps in identified priority sectors. AusAID will assess applicants for their professional and personal qualities, academic competence and, most importantly, their potential to impact on development challenges in the Caribbean. Continue to check this website for information on the 2014 round of scholarships. Applications are usually in April. OFID (OPEC) Scholarships: OFID (The OPEC Fund for International Development) is pleased to announce that qualified applicants who have obtained or are on the verge of completing their undergraduate degree and who wish to study for a Master's degree are welcome to apply for the OFID Scholarship 2013. The OFID Scholarship will be awarded to support students or candidates for Master’s degree studies. The applicant must be from a developing country, and he/she must first obtain admission to pursue a Master's (graduate) degree in any recognized university/college in the world. The Scholarship is open to those students who wish to pursue studies in a relevant field of Development or Energy Studies. The winner of the OFID Scholarship Award will receive a tuition support of up to US$50,000. Continue to check this website for information on the 2014 round of scholarships. Applications are usually in May. Student Inventors Competition:The Collegiate Inventors Competition promotes exploration in invention, science, engineering, technology, and other creative endeavors and provides a window on the technologies from which society will benefit in the future. Entrants must be enrolled (or have been enrolled) full-time in any U.S. or Canadian college or university at least part of the 12-month period prior to the date the entry is submitted. Continue to check this website for information on the 2014 round of scholarships. Applications are usually in June. Microsoft Scholarships: A Microsoft scholarship provides an advantage so you can pursue studies in computer science and related technical disciplines. To be eligible, you must be enrolled full time in a Bachelor’s degree program at a 4-year college or university in the United States, Canada, or Mexico at the time you submit the application. The Deadline is usually in January. Continue to check this website for an update on calls for applications for 2014. OAS Scholarships (Brazil): The Organization of American States (OAS) and the Brazilian Universities Coimbra Group (GCUB) are providing more than 300 scholarship opportunities to outstanding citizens of OAS member countries to study masters or doctorate programs in Brazilian universities Continue to check this website for information on the 2014 round of scholarships. Applications are usually in August. OAS Scholarship (Graduate): OAS Academic Scholarships are awarded for full-time studies at a university or higher learning education institution in an OAS Member State with the exception of the applicant’s sponsoring country in eight (8) priority areas of study. OAS Academic Scholarships are awarded to undertake graduate studies (Master’s or Doctorate degree) and/or graduate research leading to a degree at a university or higher learning education institution (Not Post-Doctorate) in an OAS Member State. Continue to check this website for information on the 2014 round of scholarships. Applications are usually in March.